How To Teach Your Baby To Self-Soothe? When To Teach Your Baby To Self-Soothe? How To Teach A Baby To Self-Soothe? Imagine your one-year-old baby putting herself to sleep. Unbelievable, isn’t it? But what if it happens? Your baby sleeps, wakes up in the middle of the night but doesn’t bother you. Instead, she goes back to sleep without a fuss. You wouldn’t ask for more. Studies suggest that one of the factors that determine an infant’s sleep through the night is based on whether she learns to self-soothe during the first five months of her life (1). MomJunction tells you how to teach this self-soothing technique to your little one. Self-soothing means the baby’s ability to fall asleep on her own, without the need for an adult to rock, cuddle, pat, carry or shush her to sleep. Most pediatricians today strongly recommend parents to allow the baby to go to sleep on her own or self settle rather than spend hours rocking her to sleep. Studies suggest that these sleep associations are powerful (2). However, a baby’s ability to do this depends on their temperament and personality. What may work for one baby may not work for another. Most babies need to be taught to self-soothe while a few are natural self-soothers (3). You can expect your baby to begin soothing herself to bed anywhere between four months and one year of age. In some cases, a few babies may take a little longer to learn this art. Self-soothing, as the name suggests, involves simple yet effective self-managed tools to calm oneself down when either too stressed or extremely irritable. We all, in fact, use many simple self-made strategies or self-soothing tips to calm our nerves. Do the same to help a baby self-soothe. To motivate your child to master a self-soothing practice, make sure she can get her hands on her face, mouth or midline. You can help your baby achieve this by swaddling her and putting her hands towards her face when you do so. Self-exploration is another simple way to help your baby self-soothe. Let her derive pleasure from simple self-initiated acts or movements. Most mothers tend to remove their baby’s fingers from their mouths the minute they begin to suckle. Avoid it. You can try simple self-soothing techniques once your baby has turned about four months old. If you start too early, your baby might get fussier. If you do it right, your baby will learn to self-soothe in less than a month’s time. In the initial days, your baby cannot control her movements to be able to self-soothe herself. She is still adapting to live in the outside world away from the warmth of your womb. You have to be patient and understand her need to depend on you for everything from food to falling asleep. So, you will need to rock, pat, and carry your baby around for her to fall asleep. Do not worry about your baby getting into a habit of being cajoled and rocked to sleep, as habits don’t develop until she turns three months old. 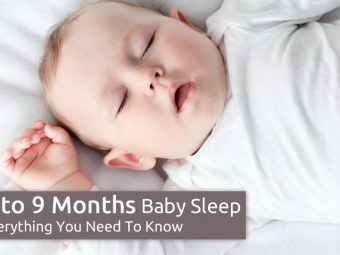 As your little one approaches the four-month mark, you can teach her to sleep on her own. A few babies learn to self-settle, almost overnight, while other babies need support and encouragement to learn this new skill. You can teach your little one to self-soothe in various ways. Do not rush. Take one step at a time and allow for your baby’s body and mind to learn and adapt to the new skill. Slowly progress from having to hold, rock, swing and co-sleep with your baby to putting her to sleep through self-soothing. The power of the technique lies in taking one step at a time. This is the simplest way to put your baby to sleep. They hold them in their arms and rock them to sleep. The baby is put down in her crib when she is fast asleep. Step 1: Prepare yourself to be ready to let go. This is perhaps the most difficult step for you as a mother. Step 2: When you are ready to teach her to sleep on her own, put her down a bit earlier than usual; just a minute or two before she falls into a deep slumber in your arms. Step 3: Gradually advance the stage at which you put her down: from asleep to half asleep and then finally when she is still awake. You should be patient and keep trying it several nights until your baby is ready. Your baby will sense your intention and plop into sleep on her own! Choose a toy or a blanket, which brings a smile on the baby’s face. Train your baby to use it as a soother. Let the little one get used to the new pattern. She will start developing a strong association with her blanket or toy. Now you can start using the tool to help her sleep at night. When your baby begins to cry at night, give her the blanket or toy as an alternative to the usual patting or nursing. This step is challenging and needs patience. Your baby is still learning. Trust us, on the last day of your eight-day trial, your baby will be all set to self-soothe. On day 8, instead of propping the tool into her hands, just drop it in the crib. If she wakes up at night and begins to fuss, do not jump in. Leave her for about five minutes, and she is likely to find her prop and put herself to sleep again. Self-soothe is a crucial milestone that most doctors may miss telling you about (4). This milestone is just as important as sitting, walking and grasping things. Here are a few benefits of self-soothing. Self-soothing not just helps your baby sleep better, but also makes her stay in control of herself. A baby who can self-soothe is likely to be less fussy and restless (5) all through the day. Issues related to fussing, such as colic, will also reduce considerably. If you, as a mother, can promote independent sleep associations during the night, you will find your child a lot more active and less cranky through the day too. If your infant can self-soothe as she enters into the light sleep state, she will be able to sleep without much trouble and your intervention. She can also go back to sleep on her own if she wakes up in the middle of the night. Gradually, your baby will learn to sleep longer without waking you up. Doctors believe that babies who can self-soothe get a good one hour of extra sleep, which is essential for their growth and development. When your baby learns to self-soothe, she will be able to regulate her moods better. She will be able to focus better on learning new skills and will be more confident (6). If you can teach your baby to self-soothe, your days and nights will be a lot more settled, and you can carry out your daily chores without too many breaks. It is certainly a lot easier to care for an infant who can self-soothe than a fussy baby who requires constant interventions just to sleep for a few hours at night. You can follow several tricks to make your baby learn to self-settle. The right ambiance can do wonders in calming your baby’s mind and promoting good sleep. Music can be a great soother. A musical mobile toy can be safely attached to your baby’s crib. These sensory toys play melodies such as Mozart that will help your baby fall asleep. Many of these toys also have a projector and chimes that will add to the soothing effect. Studies suggest that white noise is a proven sleeping aid for infants and more than 80% babies tend to fall asleep in less than five minutes when soft music is played. As your little one grows, she would learn to switch the musical mobile herself and soothe herself to sleep. Establishing a regular bedtime is vital as you set an internal clock that helps her feel sleepy at a predictable time. It should not be too late in the night, as babies get very tired and find it hard to calm down. If your little one is too overwhelmed to settle down by herself, try moving her bedtime further. Ensure that she is not a complete wreck by the bedtime. A calming night routine helps the little one understand that it is time to go to sleep. The routine may include activities like giving a bath, reading a book, singing a lullaby or having a cuddle. Keep the lights dim and interaction low at night so that you do not disturb your baby when she is asleep. Even minor disturbances can jolt your baby out of bed until she is 12 weeks old. Install a dim, soft light that will be reassuring for your baby should she wake up in the middle of the night. A light will help her self-soothe back into slumber. Build a routine and see the difference! To teach your little one to fall asleep without your intervention, put her on the bed when she is drowsy but still awake. Give her plenty of chances to sleep by self-soothing, without you being next to her. She may not learn it right away. But be patient and remember that some babies take more time than others. Your baby may still be building the ability to self-soothe. Some babies are rather sensitive, and the slightest change in temperature, light settings or even noise can disturb them. If your baby wakes up too often at night, check if anything is disturbing her. Your presence can just do the trick. Instead of carrying your baby and soothing her to bed, you can stay close to the crib or walk around her room. Your presence may be all that your baby needs to help her self-soothe. This is a tip that will work! Wear a scarf around your neck during the day and hang it near your baby while she naps during the day and night. It will be reassuring to your baby, and act as a powerful soother. Even as you follow the above tips, you need to do some things and not some others. Control yourself from intervention. Check if you are getting in the way by rocking your baby to sleep, comforting her at the first cry or expecting her to sleep when she is not yet ready. It is important that you give your child ample time to try and settle herself. Often babies, groan and moan a bit and then settle down. Unless your baby is crying, give her some time to figure it out. In case of incessant sobs, respond and try to find the reason for your baby’s stress. You are definitely not helping your baby learn self-soothing if she is used to falling asleep while breastfeeding or feeding on a bottle. Ditch the habit. Gradually shorten the time you spend feeding her or shift the feeding time away from bedtime routine. Avoid consistent soothing by rocking, patting or nursing your little one. Instead, watch out for her ways, kiss her good night and walk out. Stand outside the nursery so you can observe her from proximity. You will be surprised that your baby will not only learn to stay a few minutes away from you but also gently soothe herself to bed after she has played and kicked around for a while. Here are some habits you should avoid while teaching your baby to self-soothe. Pushing her in a pram or buggy to facilitate sleep. Using a pacifier to get her to stop crying and fall asleep. Allowing her to stroke your tresses and fall asleep. The real challenge lies in breaking these habits. Once you have been able to break them, it will be easy to help your baby learn to self-soothe quickly. But, remember this is necessary only for babies older than six months. Until your child turns six, do not worry about the habits getting ingrained. A baby who has learned to self-settle can be left awake, and she will sleep on her own. Do not get worked up and frustrated if your baby does not learn to self-soothe at the end of eight days. Do not force things the wrong way as this can be overwhelming for both of you and can also hamper future success. Set the stage right. Practice the new skill with your baby a few times before you let her figure it out herself. Simply putting your baby down on the cot does not work for all babies. Use well-defined progressive techniques and exercise. Remember a lot can be achieved through gentle ways. Taking these simple measures helps your baby learn the self-soothing technique easily. It is a skill that will not just help to fall asleep but also avoid situations like separation anxiety or frustration. Help your little charm grow independent. 1. 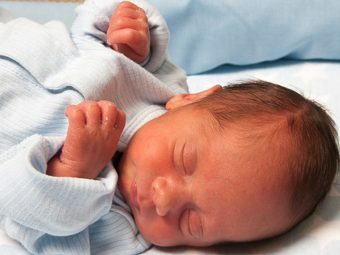 What to do if the baby does not self-soothe? Most babies learn quickly and begin to drift to sleep without much fussing or protesting. But a few can be stubborn. Older babies who are habituated to being nursed or patted to sleep will take some time to grow out of their habits. In such cases, make it a gradual process. Your best bet is to follow your instincts instead of doing something you feel will not work or can be detrimental to your baby. Observe your baby and follow simple techniques that work for both of you. No one method works for every newborn or toddler and mom pair. 2. What if my baby can’t sleep without nursing? If your baby is used to being nursed to bed, you will have to break this habit. Simply, feed your baby much before your planned bedtime routine or reduce the minutes of feeding during sleep. When did your baby begin to self-soothe? What tricks did you use? Leave a comment below. 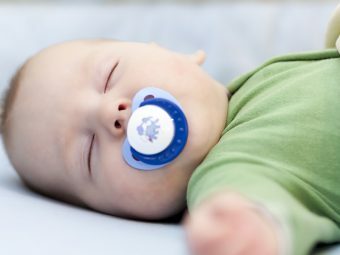 Why Does Your Baby Sigh During Sleep? Is It Safe To Let Your Baby Sleep On Her Tummy? 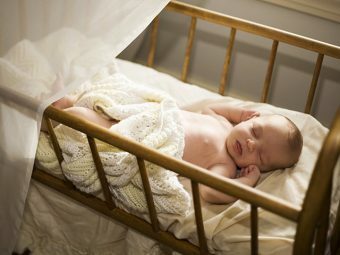 How To Get A Baby To Sleep In The Crib?